2. Study the impact of devolution and other federal streamlining and efficiency efforts on major state agencies, including full-time equivalent employee (FTE) increases, major programmatic changes, and administrative costs to the state. The Committee shall also study conflicts and overlaps among agencies resulting from federally devolved functions and responsibilities. The Committee shall coordinate study of this issue with the Committee on Finance. The final preparation of the report will be the responsibility of the State Affairs Committee. 3. Evaluate the safety of the state's commercial trucking industry, including the safety of roads and bridges; enforcement of truck safety regulations by the Department of Public Safety and other law enforcement entities; the effectiveness of current laws relating to oversize and overweight vehicles; and the adequacy of the fee structure designed to compensate county governments for road repair. 4. Work closely and coordinate with the Finance Committee in their review of employee benefit issues facing the Employees Retirement System (ERS) and the Teacher Retirement System (TRS). The final preparation of the report will be the responsibility of the Finance Committee. 5. Study the funding and expenditures of metropolitan transit authorities (MTAs) and budgetary relationships that MTAs have with the cities they serve. The Committee shall analyze the overall fiscal management of the MTAs and the effectiveness of their delivery of services on a cost-benefit basis. 6. Study whether certain types of vehicles such as buses for mass transit, EMS and fire fighting vehicles, and heavy trucks should be subject to all of the licensing requirements applicable to automobile dealers. 7. Evaluate the cost-effectiveness of the purchase of insurance and surety bonds by state agencies and institutions, including an evaluation of premiums paid and claims recovered. 8. Consult and coordinate with the Committee on Finance in their charge related to examining the policies and practices used to invest major state funds. The final preparation of the report on this issue will be the responsibility of the Finance Committee. 9. Monitor the implementation of the following bills enacted during the 76th Legislature, Regular Session: SB 138 relating to government restrictions on the exercise of religion; and HB 2611 relating to electronic reporting of certain political contributions and political expenditures. 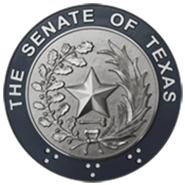 10. Review Texas' State Use Program and the benefit provided to persons with disabilities. The committee shall examine the powers and duties of the Council on Purchasing from People with Disabilities (the Council); funding methods for the Council staff and activities; the Council's oversight of the central non-profit and community rehabilitation program work centers; the utilization by and satisfaction of customers with goods and services provided under the program; the nature of disabilities required for participating in the program, and the adequacy of rules governing the State Use Program, including whether standards of eligibility for work center products and services should be added to statute. The committee shall also ensure the appropriate nature and amount of involvement by people with disabilities in the production of goods and provision of services.